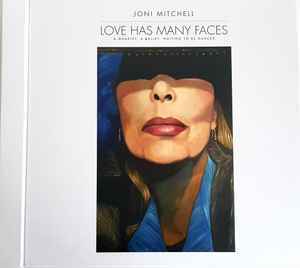 Audio appears on 12 out of the 16 sides of vinyl (A, B & C) with four sides (D) featuring etchings of Mitchell’s artwork. Disc sleeve fronts have track lists with durations. Last page of book section and disc sleeve backs have paintings by Mitchell, partially replicated on B-side labels. Etchings are based on the Mitchell paintings appearing elsewhere on the item. Release credits are listed on the back of the last inner sleeve. This work is dedicated to Jean Grande Maître and the Alberta Ballet. Most of this music was assembled at home. Joni was assisted by Matt Lee and Steve Wessing. Additional mastering was provided by Bernie Grundman. Thanks to the people who helped me sequence this release: The Alberta Ballet, my Handyman Dougy, Matt Lee and Steve Wessing. Thanks to Matt Lee and Steve Wessing for recording Ambrose on Borderline. Thanks to Lisa Glines and dear Kate Dear for their assistance in the packaging design and layout. 2-C4, "Come In From The Cold (Edit)", listed as "Come In From The Cold". 5-A4, " Borderline", includes additional recording: "Thanks to Matt Lee and Steve Wessing for recording Ambrose on Borderline."